Science fair • Nearly 700 projects on display as 5th- and 6th-graders vie for accolades. 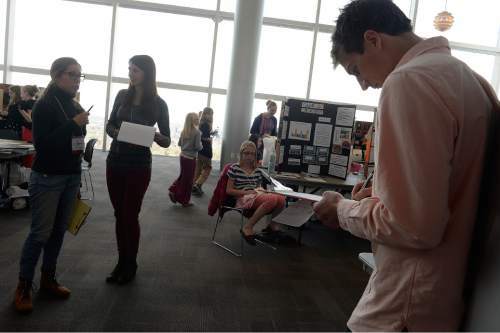 Scott Sommerdorf | The Salt Lake Tribune Mark Schwartz, right, takes time out to fill out his judging sheet while judging science projects at the Salt Lake Valley Science and Engineering Fair, at the University of Utah, Wednesday, March 25, 2015. 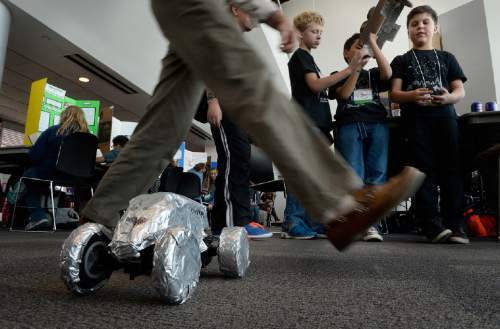 Scott Sommerdorf | The Salt Lake Tribune One of over 200 judges steps over a motorized car, driven by Samuel Soto from Millcreek Elementary, on his way to judge one of the 681 science projects entered in the Salt Lake Valley Science and Engineering Fair, held at the University of Utah, Wednesday, March 25, 2015. Scott Sommerdorf | The Salt Lake Tribune Wentao Zhang, from Midvale Middle School explains his project on computer encryption to a judge during the judging period of the Salt Lake Valley Science and Engineering Fair, held at the University of Utah, Wednesday, March 25, 2015. Scott Sommerdorf | The Salt Lake Tribune Kyle Cink, of Trailside Elementary, right, explains the concept of his group's science project to a judge during the judging period of the Salt Lake Valley Science and Engineering Fair, held at the University of Utah, Wednesday, March 25, 2015. At $2.99 a bag, Jolly Time microwave popcorn costs more than the $1.39 Western Family variety, but it also pops more efficiently than its less-expensive peers. Liberty Elementary School sixth-grader Kaden Echohawk got to the bottom of the popcorn bag as a school science experiment, cooking three popcorn packages for each of four major brands. "My hypothesis was to try and prove that cheaper brands of popcorn would leave more unpopped kernels than more expensive brands," he said. "It&apos;s about popcorn, because I love popcorn." 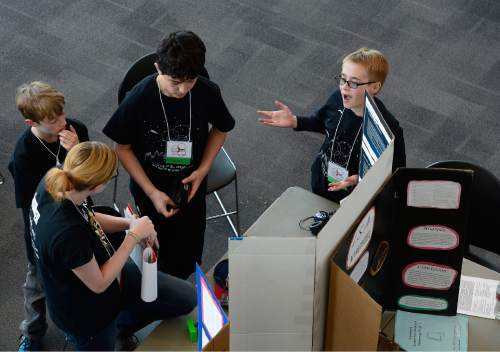 Echohawk&apos;s scientific theory was on display Wednesday at the Salt Lake Valley Science and Engineering Fair at the University of Utah&apos;s Rice Eccles Stadium, along with the work of hundreds of fifth- and sixth-grade students. Student scientists and engineers from Salt Lake, Tooele, Summit and Sanpete counties gathered this week to compete for prizes and awards. Older students&apos; work will be judged on Thursday with an awards ceremony Friday at Brighton High School. Fair director Brenda Mann, a U. professor, said she was impressed with the quality of the projects, which have trended toward hypothesis-based experimentation and away from more traditional demonstrations such as papier-mâché volcanoes and Styrofoam models of the solar system. "The things that some of these kids have built amaze me," she said. "I think its fabulous that they&apos;re able to take this initiative and figure it out." For their hypothesis, Liberty Elementary students Madison Lundquist and Alysia Shaffer asked if two fifth-grade girls could design a video game. Their conclusion: yes. "You have to try and dodge monsters and collect coins," Lundquist said as she used the arrow keys on her laptop to move a character through a maze. Both Lundquist and Shaffer said they started playing video games in second grade. They hope to work in game design when they are older. "We both really love video games and we&apos;ve been playing a lot," Shaffer said. "We always wondered how hard it is to make them." 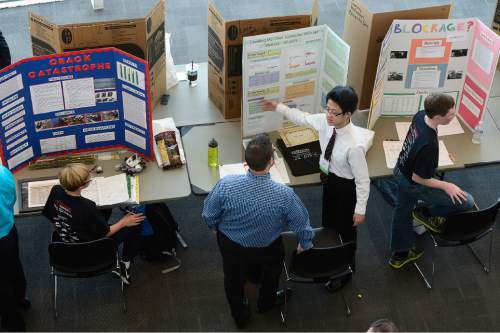 Joel Karmazyn, an environmental scientist for the Utah Division of Air Quality and a five-time judge for the science and engineering fair, said he was impressed with the overall quality of this year&apos;s projects. The fair tends to generate a few standout projects among comparatively simple experiments, he said. "But this year&apos;s students were more generally competitive at a higher skill level. "It&apos;s going to be harder, actually, to score this year," Karmazyn said. "And that&apos;s a good thing." As a judge, Karmazyn said he looks for creativity and effective presentation. A student doesn&apos;t always have to prove a hypothesis to impress him. "Sometimes the ones that fail are the best ones," he said. "The scientific method is not necessarily to succeed, it&apos;s to derive analysis and conclusions."